Shown in the picture from left, front: Melissa Stowe (Bevill State Dean of Students), Sherry Terry (Bevill State Fayette Campus Director of Student Services), Dr. Harold Wade (Bevill State Foundation Board Member), Dr. Camilla Benton (Bevill State Foundation President), Theresa Berry-Franks (Bevill State Head Volleyball Coach) and Martha Kimbrell (Administrative Assistant to the Dean of Instruction at Bevill State). Back: Joey May (Bevill State Head Baseball Coach), Will Norwood (Bevill State Foundation Board Member). Bevill State Community College announced the donation of a 2019 Startran PS/2 bus by the Bevill State Foundation to the Fayette campus. 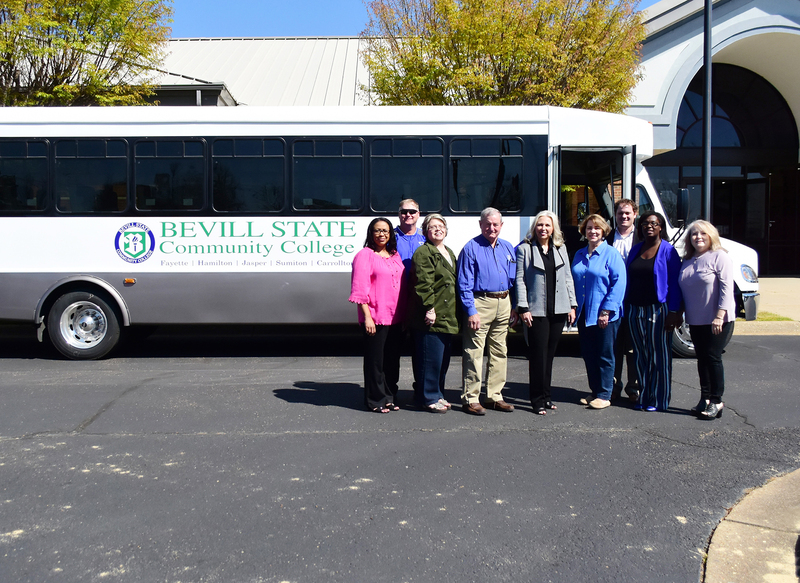 On Friday, March 22, the passenger bus was delivered to the Fayette campus of the college, where the keys were presented by board members of the Bevill Foundation.